Maria Bustos called from Mexico January 29, 2018 to let me know that Anna Zarnecki had died. 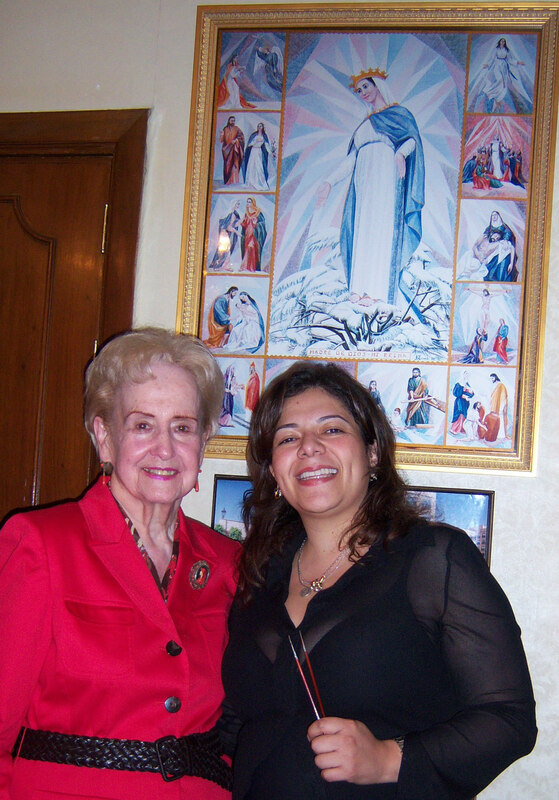 I met Anna in November of 2007, due to the work of Maria, my translator and the originator of a leadership project to identify Mexican leaders willing to talk about the role of the family in becoming a leader. The book is no longer available in Spanish but there is a plan to republish it this year. Anna kept up the relationships with me, reading and commented on my blogs over the next nine years. I will miss her and am also so very grateful for her indomitable spirit and all she gave to many. She had a tremendous ability to inspire others by overcoming hardships while remaining true to her deepest values. Anna Zarnecki lives in memory and her life story will continue to inspire many others. A survivor of WWII, and the invasion of Poland, sent to work camps in Siberia, leaving behind her loved grandfather she eventually found Mexico to be her family haven. Here she met her hero, her husband, and here she raised their children, while still finding time to devote to her most beautiful triangle based paintings and to the Red Cross. The interview with her tells us what she had learned in her family early on, that had enabled her to have the courage and the social intelligence to be a leader in society after being exposed to great suffering. Despite the evil of war, the German invasion and the treachery of the Russians there were people willing to give her a hand. A Red Cross meal would come in time to keep away starvation for another day. By bearing witnessed to both the best and the worst of human nature she understood deeply life’s fragility. Knowing her family gave her strength and the gift of persevering during terrible and threatening times. Many of us hear her story with great empathy as we too have ancestors who have overcome difficulties. Today and everyday we can celebrate her purpose filled life as she still influences all those whose life she touched. No family escapes for generations without the memory of some disaster, as in this case, war, and the resultant turmoil. Each of our lives are full of memories. Some memories we are aware of and others we have tried to ignore. To live one’s life without fear, without hate, with true compassion, this requires an examination of one’s current relationships and the influence of memories. Anna Zarnecki stands above the suffering by recognizing the importance of living a life centered on principle. In so doing Anna Zarnecki was able to define and then fight for her deeper values. Bowen defined a scale of differentiation. I call it emotional maturity, correlating with levels of awareness and one’s ability to take actions based on knowledge of emotional process. That is the ability to see and not react to increasing fear, real or imagined. More mature people seem to have a greater ability to regulate self in the midst of even life threatening events. The assumption is that a more mature person is able to integrate their memories so that they are aware of the instant reactivity, perhaps to seeing a Germans or a Japanese due to because of an experience in WW II. Perhaps the fear is originated by a parent who died young of cancer, or a drunken father or mother with whom one had a very negative life experience. Many events happen which can raises the fear levels so that one can not be present to others. One of my goals in publishing the interviews with leaders like Ana Zarnecki has been to promote courage and greater awareness by giving examples of how people overcame great difficulties. I hoped to fascinated people as to how to learn to be a leader in one’s family. These interviews feature people who have learned to overcome difficulties using family support or overcoming family tragedies without support. Taking the time to hear how people understand the importance of relationships, values and principles. Leaders who understand families can easily touch others lives, inspiring people to see and understand how best to mange self in difficult circumstances. Leaders can inspire others to put life’s problems in perspective. How do I as the interviewer prepare myself to communicate with others who know nothing about me or all my assumptions? First, I try to know a little bit about the person I am going to interview. Then as the time approaches I enter into a state where I will make every effort to suspend judgment, thereby creating an open environment in order to discover the other’s story. Observing, without judgment, is a proven technique used in most forms of coaching and psychotherapy. This is also a state that can be obtained in many forms of meditation. To be aware of the content of the mind but not pay attention to it. With discipline one’s mind is capable of entering into a state of detachment from the need to cling to various points of view. How long can I do this before the judgment side arises? If you believe as I do that neutrality is needed to allow a thoughtful idea to be expressed and that it is not easy to know what one thinks, then you can see the judgment as a response to threat and fear in you then and this can help you to diminish the judging and allow the other to speak. It is safe to say that none of us completely understand ourselves, much less others. We must always be discovering who is the other based on what we “assume.” With greater neutrality there are fewer assumptions and there is less intensity and fear that is passed on from one person to another. Life lived produces learning moments. These real life stories allow us to reflect on the many ways we can become more thoughtful and less reactive. 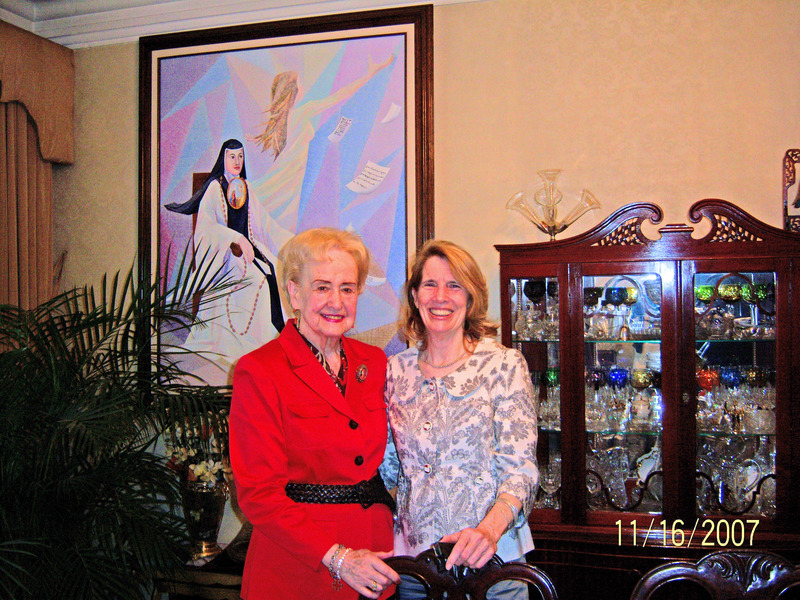 I was to be invited into the home of this well-known humanitarian, writer and painter. Being an American in Mexico City, and not able to speak Spanish, I tend to be more mindful of what I see more than what I hear. After all I am a stranger here. I am amazed as to the diversity of the people here and I am amazed at their their deep love for Mexico. On the morning of the interview I was looking around the neighborhood trying to find the house number and a place for Maria to park the car. Finally, we saw a helpful man on the street who said we were in the right spot. He was directing children headed for school. An enthused group of young Hebrew students, filled out of a bus. I wondered what stories would they be telling and who would be listening to them? Ana Zarnecki’s home welcomes visitors with a charming flowery patio. As Maria and I waited for the door to open we were entertained by colorful flowers. When the door opened a tall, blond woman emerged with a friendly smile, inviting us to enter. I had my plan. I was all, ready to sit down and proceed with the interview but as soon as I saw the incredible paintings on the walls I asked one question, Is this your art work? Now we were off and running. Anna Zarnecki began telling us about her paintings. There was no sitting and listening. I was semi mindful of the change and the challenge of focusing on her life story in the midst of all these paintings. But I thoroughly enjoyed falling into her enchanting way of telling stories and seeing her amazing paintings. There was little I could do to keep this interview on a single track. Instead I followed her as best I could. I began to formulate the questions but Anna Zarnecki was already saying that her first instructor at art school did not like her painting. Her first painting was rejected but now holds a place of special honor. This painting reminded me of the courage needed to go forward with our talents, even without approval from the local authority figures. As a painter she became a survivor of criticism. Anna Zarnecki had created a different style by using thin lines, forming triangles, as the basic building block for all her art work. Nothing is easy when you have to break through established barriers, called the status quo. Even in her loving family things did not happen easily. Perhaps because of the challenges and how she meets them, she has emerged to become the leader, the artist, the writer, the wife and the mother, and the grandmother that she is today. As always I am wondering what gets a person going. What gives them the insight to see what needs to be done and the energy to do it? And then of course what can you and I learn from her story? AZ: We must fight to do everything. AMS: I understand you had to convince your husband to let you go to art school? Was his reluctance just part of the way life was after WW II? As I recall many women stayed home and did not engage in community activity. In fact there has been a long struggle in America for women to have more of a public life. I just was reading the life of our second president John Adams. The poor man had to have many discussions with his wife about increasing woman’s role in society. Abigail Adams even tried to convince her husband that women should be educated and should be able to vote. AMS: That is so beautiful. You tell your nun friend and after she talks to him, he can see the situation differently and so he changes his mind. He let you go and did not keep defending his old way of thinking. That is a gorgeous triangle. The more neutral third party, in this case, your nun girlfriend is the person who influenced him so that he could think well. This nun is also the person who influenced you to believe in the power of your first Jesus Christ painting? This is also when you began using your triangle technique. Then amazingly triangles are basic in your paintings and they are also the building block of all social networks. In family therapy a triangle has three people. In the best of circumstances there is one outside person, enabling the two sides (you and your husband in this case) to be able to be listen to one another. I assume, your friend made it possible for you all to rethink your positions. In describing social triangles you often see and feel that two people are close and one is on the outside. Triangles can go in cooperative or destructive directions. If negativity is in the triangles, polarization arises and this often pulls people apart. Triangles can be useful when they are open, cooperative. They can function to clarify misunderstandings. They can be deadly when two gang up on a third and extrude them and of course often people or nations think they are right to do so. We see this in families and in grade school and of course more cleverly at work and in international politics. It can happen innocently as when two people gossip behind a third person’s back. For example if I don’t take sides with Maria and I don’t take sides with you, then I can talk to each of you about any topic without threatening the relationship system. To stay in contact and not to take sides takes real maturity or mindfulness. It is an extremely important concept in family systems theory and very hard for people to understand or to see how they participate in triangles. The dark side of triangles is that it becomes two against one. Think of the Bible story as when Eve and the snake putting intense pressure on Adam to change his position and go along with them. What chance did Adam have to think for himself? As you see I write about the triangle and you paint with triangle lines. Another thing we have in common is names. Anna is also one of my family names. Anna was my mother and my maternal grandmother’s name. Now can you tell me a little about your family? AZ: My son, in this picture, went to medical school at Johns Hopkins. He also went to Chapeaus in the southern part of Mexico to see how the indigenous people lived. After a year he told them he had to go back so that he could help people more at a policy level. Now he is working in the Ministry of Public Health acting as a Director of the Public Health Development. AMS: I see you have painted the working poor? AZ Yes, I think that all people are important, no matter the skin color. The pictures you paint come to you as an inspiration? AZ: Yes, because I am thinking about what is happening all around the world. I also know how important it is to pray for helping all the people of the world. AMS: I know a little about your life. As I understand it you were in the camps during the Nazi era. How long were you there? AZ: For more than two years. AMS: Why did your family decide to go to Russia? AZ: When the war began we knew the Germans were coming and we heard the Russians say they will save us. We thought we could be saved. But they took everything from us. Lot of people will never know how much we lost, houses and horses and everything. They left us one horse and two cows. We could live only in the kitchen. There was only one room for the whole family: my grandfather, grandmother, my mother, my father and my sister. In the other room were the men of the Russian Army. For one year we worked and had no permission to do anything else. I still recall when they came. I was 13 years old. One day I was working in the field with my grandfather and we saw a lot of soldiers with rifles and they asked for my father. In 15 minutes we had to take our things and go with them. That was terrible. They took us to the train. It was a train for animals. They put us in box cars and sent us to Siberia. We were on the train for a while then they put us on a ship for about three days and later they put us on a small train for five days and then they made us walk to the place where they gave us one room with a lady who has nine children. That family hated us, as we were making their situation worse. We could only sleep down on the floor. AMS: Your mother, your sister, and your father still with you, but what happened to your grandfather? AZ: The Russians did not want to take my grandfather to Siberia. He was too old to work so he stayed there and passed away very soon. AZ: Yes. I am agree, I though he was ready too, because he was a saint. But he was suffering thinking of us and his last words were to ask for a piece of bread for my aunt. He blessed the bread and prayed for us in Siberia knowing we were hungry. We stayed in Siberia for about two years. After this my father took us from Russia to Persia and later to India. The authorities asked us where do you want to go? We picked Mexico over Africa. AMS: That seems to have been a very good decision. AMS: And you came out of this experience with this great love for humanity? How did that happen? AZ. The Russians invaded Poland and took us to the concentration camps in Siberia, named “Journey Chormui Kluch” in order to work. We work very hard in the camp but they did not give us anything to eat. So my mother sold clothes, sweaters and dresses to pay for food. We sold everything that we had hoping that soon my father will return and bring us papers and food. AMS: Who did you buy food from? AZ: From the collective. My father was in the Polish Army. He went to process our papers so we could get out of the country. He was gone a period of about two or three months when we didn’t have anything to eat. It was very hard. We just took grass and put a little bit of flour and made something like a tortilla and we ate them. I want to highlight that I got sick all my body was bloated. Then we receive an “International Red Cross package.” This food helped me to survive until my father came to take us out of Russia. The Red Cross package includes rice, flavor, sugar, (that we had not tasted for 2 years ago as well as salt) syrup, and some clothes. Immediately my mother changed my cloths and fed me, which saved me from death or disease. This package was the principal motivation that encourages me to work and serve the Red Cross as volunteer during the last 38 years. It is important to say I was willing and able to support and help people as I was helped in that extremely situation. It is important to clarify that my father was a volunteer in the Polish army to fight against Hitler. This was a key piece in his ability to get papers and take us out of the concentration camps and take us to Teheran, Persia. It is historical to remark, that in this time were 35,000 Polish people, who were freed from the concentration camps of Russia and went to Persia and then emigrated to other places. We came here to Mexico, to a small city named “Leon Guanajuato”. AMS: No other family was left in Poland? AZ: My aunt was still there. AMS: Is she your mother’s sister or your fathers? AZ: My mother’s sister who later went to live with my mother in the United States. AMS: Was your father an only child or did he have some siblings? AMS: As I told your mother, she paints triangles and I write about triangles. My focus is on how leaders learn to understand relationships. I wanted to interview people, like your mother, who has been an important leader in Mexico and who has made her way through incredible odds. Dr: Thank you very much and welcome to Mexico. We all move through example. I’ll go visit my father and see you later. AZ: He wants to see his father because he’s been a little bit sick. He’s 94 years old. We have taken care of him most of the time. When he is very sick it is hard for me to go to the Red Cross and work everyday. It’s enough for me to do to take care of him. AMS: We can see other pictures now and still talk. AZ: Now here is a picture that I painted of a Polish camp worker. And this one is of my granddaughter, who is also a doctor. Right now she’s interning. This next painting I did was for my mother when she lived in NY City. It was a very big picture so when my mother passed away, I was going to bring it here but it disappeared and so I painted a smaller one. This is a painting of the house where I was born. AZ: The house was about half a mile from a very nice lake. I wrote in my book about it and these people are my grandfather, my mother and my sister. AMS: You grew up with your grandfather living in your house with you or close-by? AZ: No, we were with him often on vacations. When the war began I went to live with him. I have remembered a lot of things about that time and I wrote all about it in one of my books. I translate this book into English but I have yet to publish it in English. AMS: It is hard to find publishers but you can put the books on the web and people can download them through Amazon. In the future this will be common practice I believe. Everything is going to be digital. We probably won’t have many books to lug around in ten years. Amazon now has “Kindle” so you download your books electronically and you can read it on the Kindle. Of course they will also publish your book for you but I am not sure how you go about all that. AZ: This next picture is one that people asked me to paint. AMS: How long does it take you to paint a picture like that? AMS: How does your day go? AMS: How did you get involved with the Red Cross? AZ: I started in the Red Cross when I came here. Now I have worked for them for 38 years as I told you before. At first my sister who was working in the Polish Embassy and I wanted to live with her here. AMS: Is she’s your older sister? AZ: Yes. The authorities said, you don’t have papers to live here but if you want to study at the Red Cross that will give you the correct papers. My sister and I were thinking that maybe we will stay in Mexico, maybe six months or one year and then we will go back to Poland. I never thought I would be able to finish my nursing study or get married to a wonderful Mexican man. But even when the Second World War finished we could not go back to Poland. The part of Poland where we lived was occupied by the Russians. So we decided to live in Mexico, where I finished my nursing studies. Then I was fortunate to marry my husband. After this the Mexican Red Cross organized an international bazaar for raising money. Through the Polish embassy I began working with the Red Cross to raise money. When we did very well, one of the Mexican ladies asked me, Why you come and don’t work for all of us? I decided yes, and became a member of the International Red Cross. Every year we have a very big party where even the president’s wife comes. Everyone was working and helping. I was still volunteering at the Red Cross, when the President of the Mexican volunteer’s ladies asked me to be her Vice president. AMS: Wow! You must have been a very good worker. AZ: Eventually with my passion and good work I was elected to be the National President of the Mexican volunteers’ ladies. AMS: I am sure that was a well deserved honor. AZ: I had to travel all over Mexico and to talk to all of the volunteers, to show them how to work and how to make money. They liked me very much and I worked very hard for them. After years of hard working with the Mexican Red Cross they asked me to be the Mexican Chairman in the International Red Cross. Acting as a Chairman I participate in International congress in United States, Ginebra, Guatemala, Chile as well as other countries. When I was in one of these congress (Ginebra) my husband fell down and he broke all of his ribs so I came back and I said I am sorry but I can’t work for the International Red Cross I have to take care of my husband. They understood. However I still working as an advisors and as a board member. Then I was a little bored. I still have my office there with Red Cross. It is very difficult for me with my husband but when they need me I go. They know that I have problems … but they want me to stay there and work when I can. When I saw him the first time, he took my hand in his hand and he and he was just asking me questions and talking. The Pope asked me when I first came to Mexico, and I told him that I came from Siberia with 1,400 Polish refuges to Santa Rosa Leon Guanajuato. He told me “My daughter, we have had the same suffering living road, but we need to follow Christ”, and He repeat again “We must follow”. After that marvelous meeting my life changed. Suddenly I began to write in the Red Cross magazine as well as I began to be an important speaker in the Red Cross congress, and I began to write my books. I don’t know what he did to me. He changed my life. For a long time I was feeling like somebody strange to myself. AMS: What year was this? AZ: I think it was 1984. AMS: Do you believe that people can transfer their energy one to another? AZ: Yes, I think … because it was some something I felt. I know that some energy was created or transferred right then. The pope told me, we must follow the path of Jesus. It was all very nice but I really don’t know what happened. Afterwards I was very strong and I felt I can do everything. We were close because we are Polish. AMS: I would guess you were somehow in the receptive spirit and the Pope knew that. Someday there might be a scientific explanation but who cares if we totally understand just how it works. AZ: Talking again about the Red Cross I was given many awards and received two of the most important ones for the volunteers “La Gran Cruz” and “Ben emeritus” medals. AMS: Now you go to the Red Cross and you come home and you have dinner and then you paint until eleven at night? AZ: I also work on writing my books. About 20 years ago I translate a book about the most important Polish writer named Teodor Parnicki who is considered a literature Nobel Prize. He was working here with the Polish embassy “Consejero de asuntos culturales”. My sister works in the same embassy. When the second war work finished and the government changed they were dismissed of their respectively jobs. Therefore my friend didn’t have any way to earn money while he wrote. I translated his book. It was about the history of Rome about 900 years ago to this century. Nobody wants to write a book like this. I still want to have this book publish because it’s a beautiful book. Now there are a lot of people who is interested in history. AMS: If you publish a book, then everyone can have it that wants it. It is not like a painting. Only one person can have that painting, but with the books, everyone can have it. AZ: Yes that right. Let me tell you that after I wrote “Polonia Viento y Tinieblas” an “Huellas en el alma”, and “Tecnica inovadora de triangulismo de Ana Zarnesky” I finished my book about Red Cross in which I describe my life in the Red Cross and the evolution of the Red Cross. I hope to include my 8 paintings referring to the Red Cross. I gave this one to the president of American Red Cross. It has a big Red Cross where a little Mexican girl emerges with a piece of bread in her hand and a lot of different people are asking for a part of that bread, but she has only one. I expressed in this painting the lack of possibilities for help for the many peoples that are asking for help. AMS: Do you have a history in your family of people in service? AZ: I really don’t know, maybe my Grandfather on my maternal side, who was well known in the town, was like a great leader, his name was Piotr. He always tried to support people. AMS: How about your paternal grandfather? AZ: He too was always working for everybody. He had many friends and he made houses for every worker. AMS: So you saw how he gave back to his community. Now, your children have seen how you give to your community. AZ: Yes let me tell you about them: my oldest son is helping the church and founded a foundation to support orphan girls with no parents. The foundation build an Orphanage named “Refugio de Maria”. I painted thirteen stained glass windows that I donated to them. My youngest son, who is the Doctor that you met, encourage the project for the “Seguro Popular” (Health Insurance for poor people) when he was Director of the Health School in the “Instituto de Salud Publica.” In addition to my family I have met many different and famous people who are giving back to the community through the Red Cross. AMS: Now when you had earthquakes do all these people go down there and help out? AZ: Yes everyone comes to work. It has been an amazing to see how people support others in a solidarity and brotherhood way. Mexico is prone to a variety of natural disasters including earthquakes, hurricanes, flooding and drought, the MRC runs a disasters training school in Toluca. To better prepare and respond to these disasters, the school offers free training in a full spectrum of emergency response activities. AMS: In the States that is what happened with September 11th with the terrorist attack … and all the Red Cross people participated. AZ: We here were also very concerned. I wrote a letter to the American Red Cross regarding our feelings and concern about it. AMS: Lets go back to the time after you got out of the camps did you and your mother and sister came to Leon Guanajuato in Mexico. Do you think that since you’ve suffered a great deal you don’t want other people to suffer, and that you are motivated to try to end suffering? AZ: Yes, of course for me this was the most significant fact that pushes me to be the person that I am. I always try to help others avoiding the suffering. I have also found a way to expressed hope, and yet the reality of suffering, through my paintings. AMS: It is an amazing story. You came to Mexico, the immigration authorities let you know that you can stay by taking courses with the Red Cross. Then you meet and marry your husband and find a wonderful man with a great family. You learn the skill of painting and are able to transform your personal suffering through your paintings and of course by creating this warm and giving family. Your paintings are like celebrations. Each painting reminds us of the history of people suffering and yet gives us hope and perspective. How many people will come out of intense suffering and give back as you have? 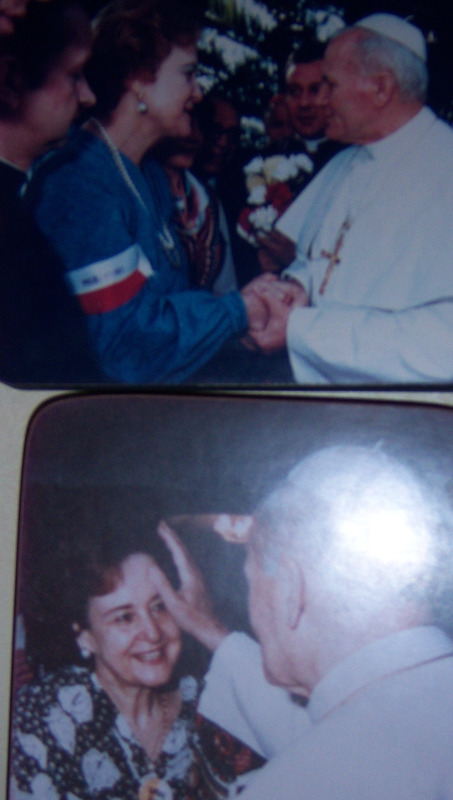 AZ: My grandfather, Piotr, influenced me, by saying, when you receive one favor you have a debt and you must give back. I think I tried to comply with this principle. AMS: can you tell me more about the books you have written? 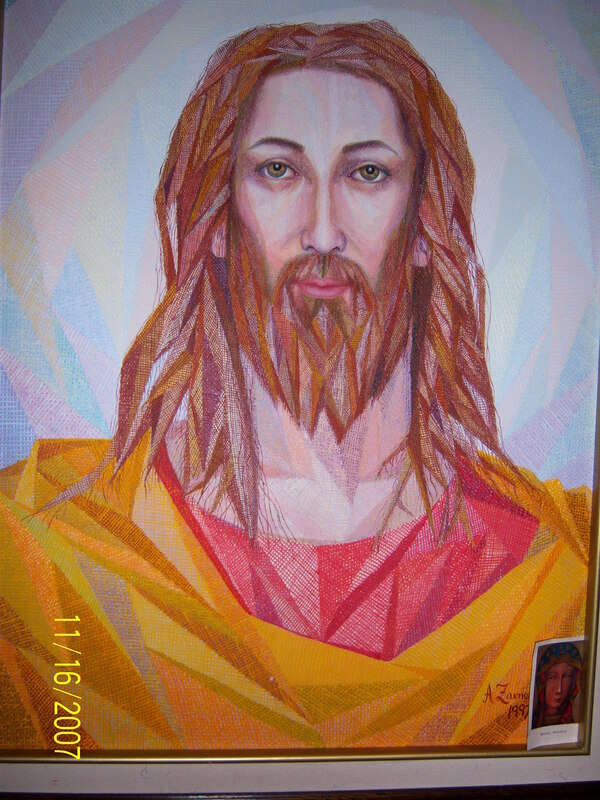 AZ: In the “Técnica Innovadora de Triangulismo”, I have many pictures of my paintings. I have painted about 250. I wrote a book called, Light in the Shadows. It is a very hard book because it covers the time from the first war to the second one and describes the life of one my aunts and my grandfather. Hopefully this book will allow others to know the people and to understand why they are fighting. Also it includes how difficult the war is as well as what it was like when the peace arrived. In this book I wished to demonstrate that the war only leads to destruction, poverty and suffering. AMS: Many people are still being threatened with versions of these problems. There are still governments that take the people’s goods and lands and where many people are starving. Always work to do. AZ: My grandson is a philosopher and he’s a writer and I hoped he could help me edit this book but he’s working in the university and he has his own job. AMS: How old is he? AZ: About 26 years old. AMS: Perhaps he will be one of the younger generation to help change the world. AZ: Yes, I hope so. Also I have another grandson who is studying in England and plays the guitar. He has been able to obtain government money to investigate music and mathematics on the computer and compose. He has had 6 concerts in Europe. AMS: Another question is how did you meet your husband? AZ: We met in the hospital. I went to visit somebody. It was providence and it has been a lovely life we have had together. Another thing I am interested in is helping younger woman, just as my husband helped me. When I launched my first book “Polonia, viento y Tienieblas”, I was invited to participate as a member the Publicist Lady’s Association. This brings people together to raise money to so that people can publish. I have been told that my books have moved the hearts of so many people. I found a group of marvelous women immediately who stay close to my heart. God never leaves us here alone for too long. I really appreciate this fraternity of sisters because I think if we are together we are like a team with the desire to see the world become a better place. AMS: You deeply know how important it is to communicate, to keep your team together and to keep people focused and your vision alive. AZ: Yes, that is why I have written many articles in the Red Cross Magazine. Once I went to a small village to show them how to work to increase volunteers. They had framed my Red Cross magazine speech. They said we want to read it because it shows how to love people. It gives me more motivation to help people to know what the Red Cross does. Sometimes people do not understand. They think it’s just an ambulance here or there. I want them to see how deeply the Red Cross affects people’s lives. AMS: The Red Cross helped you and you had deep suffering, you were beaten with a stick, you saw the cruelty and you gave back the love. I think if you give love then you receive love. I remember when I went to one hospital. There were about 18 beds with sick women and one of them had a terrible sickness. Nobody wanted to clean her. She smelled but I put on my gloves and the special clothes and went to cleaned her. She always looking at me when I was working and one day she said, come here. She took one peso that her sister had given her and she gave it to me: I want to give you this so that so you can buy something at the candy store. It was the only peso she had. She wanted to give. I said to her, No thank you, I don’t like candy but I will go to buy a candle and we will light it for you and ask for God’s help. She said she did not know how to pray. I said I will pray with you of course. I didn’t know how to pray in Spanish but she was very happy because we prayed for her. When I came back the next day she had passed away. I remember a very sorrowful feeling because she had passed away; however, I was grateful to God because she was suffering so much. I painted her picture because she was suffering. AMS: Perhaps being such a spiritual person you saw the love of Christ in the crucifixion as Mother Theresa has said? AZ: I think it is important that those who can will give a little bit of love and then we will change the world. AMS: There are very few people who can do this but with your help and example there may be more. or live optimistic about what may happen in the future. We can face our selves with honesty, reflect about life and its meaning, talk to as many people as we can and start building, and affirming life. This will shape our actions. It will allow us to be more certain of the fact that being part of a strong community will give us a better future. Our life is in a certain way chained to the destiny of others. We build through our acts. All of us have the right to live, but at the same time we must always serve others with a great spirit of service. AMS: That is a great thought to end on. Thank you so much for taking the time for this interview. (1) The ability to define a vision: Anna Zarnecki tell us that in her early life she was taken by the Russians and sent to forced labor camp. Here she both bore witness and also experienced terrible suffering. As she noted she has been driven all her life by the motivation to decrease suffering. In addition to her 38 years of work with the Red Cross she found a way to demonstrate and live a hope filled life in her family and at work ,while still pointing to the reality of suffering through her paintings and in her books. (2) The resistance to change in self and in any system: As a youth the social unrest took center stage in her life. She was more aware of the need of her family and herself to survive. She also had to face the damage to her own body that occurred for months due to limited or no food available. Anna Zarnecki was able fight the good fight and resist giving up in the face of illness and brutality. Later in life she faced legal resistance in the requirements to enter and stay in Mexico. Understanding the regulations offered her an opportunity. She took the chance to attend school and get a nursing degree in a foreign country. Next, as a young wife, she wanted to take art classes and was able to find a way around her husband’s objections by talking with some who her husband respected. While in art school her teacher rejected her technique of drawing using triangle lines. She kept on going despite the negative comments. Clearly Anna Zarnecki has faced many instances of resistance and time and again returns to her deep value to chart a way forward. (3)The ability to connect and use systems knowledge: Anna Zarnecki never seems to be trying to figure out how to use relationships in order to achieve a goal. Instead she appears to have people in her network who want to help her achieve a goal. They can be personal or even strangers, like the person who explain the rules for immigrating to Mexico. She has inspired people by her presence, or so it would seem. Her experiences are a wonderful example of how being your best self can lead to openings in the relationship system that can support anyone’s goals. (4)The ability to be separate: The clearest examples of this ability we see in her determination to preserver in both her art work and in her ability to keep writing book with no hope for a publisher. Few of us will have the kinds of struggles she faced but for all of us her story demonstrates how one’s internal principles can function, even through incredible hardships, providing a beacon of hope and courage for one and all. FINALLY – Special thanks to Maria Bustos who spent a lot of time going back and checking facts with Anna Zarnecki. The 1939 Soviet invasion of Poland was a military operation that started without a formal declaration of war on 17 September 1939, during the early stages of World War II, sixteen days after the beginning of the Nazi German attack on Poland. It ended in a decisive victory for the Soviet Union‘s Red Army. In early 1939, the Soviet Union tried to form an alliance against Nazi Germany with the United Kingdom, France, Poland, and Romania; but several difficulties arose, including the refusal of Poland and Romania to allow Soviet troops transit rights through their territories as part of collective security. With the failure of the negotiations, the Soviets shifted from their anti-German stance and on 23 August 1939 signed the Molotov-Ribbentrop Pact with Nazi Germany. As a result, on 1 September, the Germans invaded Poland from the west; and on 17 September, the Red Army invaded Poland from the east. The Soviet government announced that it was acting to protect the Ukrainians and Belarusians who lived in the eastern part of Poland, because the Polish state had collapsed in the face of the German attack and could no longer guarantee the security of its own citizens. The Red Army quickly achieved its targets, vastly outnumbering Polish resistance. About 230,000 Polish soldiers or more (452 500) were taken prisoners of war. The Soviet government annexed the territory newly under its control and in November declared that the 13.5 million Polish citizens who lived there were now Soviet citizens. The Soviets quelled opposition by executions and by arresting thousands. They sent hundreds of thousands (estimates vary) to Siberia and other remote parts of the USSR in four major waves of deportations between 1939 and 1941. The Soviet invasion, which the Politburo called “the liberation campaign”, led to the incorporation of millions of Poles, western Ukrainians and western Belarusians into the Soviet Ukrainian and Byelorussian republics. During the existence of the People’s Republic of Poland, the invasion was considered a delicate subject, almost taboo, and was often omitted from official history in order to preserve the illusion of “eternal friendship” between members of the Eastern Bloc. The more “exaggerated” it is the more excessive crap they normally include in it. this time that muscle is actually built. easily consume 3,500 to 4,000 calories.